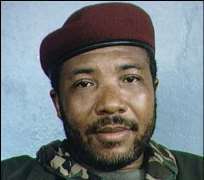 Winner of the 2008 edition of the Next Movie Stars Avennette Tenoema Sirleaf has said that her parents were killed by the former Liberian leader Samuel Doe. Speaking in an exclusive chat with http://nollywoodgists.com, Sirleaf said her father, the late Ashmadu Varfoc Sirleaf, the then Chief Security Officer of the Liberian Petroleum Refinery Company was killed in 1985 over an alleged phantom coup. Recalling how Sirleaf was killed, she said her father was arrested in the morning and taken away by a group of people on the order of Samuel Doe. Later, his wallet and wedding ring were returned to the family. She said that up till today her father's corpse has not been returned to the family, “we don't know where he was buried. Avenette, who was three years old when her father was murdered, told http://nollywoodgists.com that her mother, the late Mrs. Sirleaf, died in 2006. “She died of heart attack because the death of my father had affected her, and she was the only one taking care of us after our father's death. Avenette Tennema Sirleaf a philosophy graduate of Lady Shiram College for Women, New Delhi, India was presented with the star price, a KIA saloon car by Digital Interactive Media, sponsors of the Next Movie Stars. Speaking during the presentation of the car, Avenette said, “with the key to this car, I am opening the door to Nollywood. Also Zenziya Jonathan Wilson and Wale Muyideen, the first and second runners cup were presented with their prices.